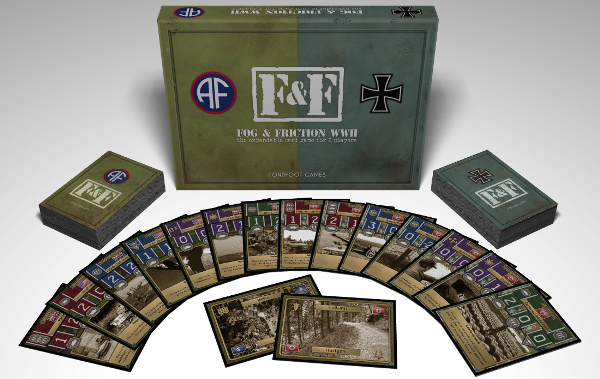 Fog & Friction (which I am desperately trying not to type as Frog & Fiction) is a customisable/expandable/collectible card game based on the conflict during World War 2. You build a deck of cards based on either Axis or Allies and attempt to capture battlefields from your opponent. One player acts as the attacker the other the defender and you will commit forces from your hand to the battlefield in an attempt to overwhelm the opposition and win the battle. As a concept the game actually plays a little more like Blood Bowl Team Manager than Conquest, but the seed of a concept is there, play cards to a battlefield to win that location. Where Fog & Friction differs is how combat is handled. Each battle is split into four stages, anti-aircraft, aircraft, artillery and then ground forces. The majority of your army is made up of ground forces, tanks and troops, and these are what win you the battle but you can attempt to take out the opposing ground troops by bombing them from the air or blasting them from a distance. This laying out of units, the commit and counter commit, is the game's main mechanic and what makes it feel like the games I mentioned previously. Trying to predict what your opponent may have while at the same time ensuring you can take out the threat and maintain dominance. It’s also unfortunately where the biggest flaw of the game is for me. Turn order goes from attacker to defender, giving the defender an advantage in that they are always reacting to the attack. Therefore, they have a perfect view of the battlefield and can place their units for the best result. This can often lead to some slow turns, having full knowledge available results in calculating all the various attack values, and, providing you cards to hand, countering the threat in the most efficient way possible. This mathiness of the stage is not my issue; instead it’s that the switch from attacker to defender doesn’t occur until the attacker wins a battlefield. In one game this meant that the attacker had absolutely zero wins and the defender won by a landslide. This concept does force the attacker to be more aggressive, forcing them to commit as much strength as possible in a hope that the defender shows their hand on the first round of defence. But the defender's best tactic is merely to commit a token force and then take advantage of their position on the final round. I personally believe the game could be much improved if the attacker defender roles switched each turn, especially as there is little advantage in being the attacker. As mentioned earlier, Fog & Friction is an expandable card game, which means that you can tailor your deck to represent the tactics you wish to use. What's unusual about Fog & Friction's approach, and how it differs from your standard CCG, is that the cards are not awash with special abilities. There are some subtleties beyond the basics, some units gain an advantage based on the terrain of the battlefield, but for the most part a card is only characterised by its basic statistics. What this means is that you're going to be taking a different approach to deck construction than you would in most other card games. The deck is now reliant on the balance of forces, and whether you slant the deck towards one particular unit type or another. Fog & Friction's decks aren't going to be built around one or two killer cards but instead the build deck as a whole is important. Fog & Friction's main selling point is its theme and how it applies that theme. Gameplay wise it's very similar to other games, but if you're not interested in Space Marines or fantasy American Football then Fog & Friction neatly fills a niche. If you're someone who gets offended that the panza maus mark two card clearly shows a mark one model then you'll also be pleased with the historical accuracy. I personally think the game could be improved if the attacker defender switch occurred every turn, it would make the game more balanced as it is it's easy for the defender to sweep the win. But it's Fog & Friction multiple attack runs, balancing air support, artillery and ground troops with its Rock Paper Scissors Lizard Spock of attack and counter that makes the game unique.